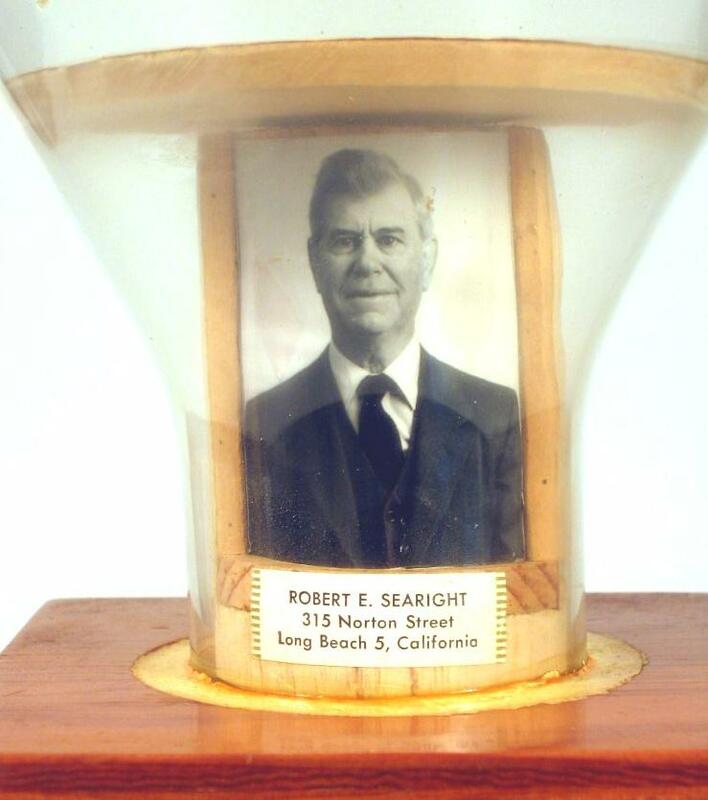 Robert E. Searight was born in 1882 and died in 1978. 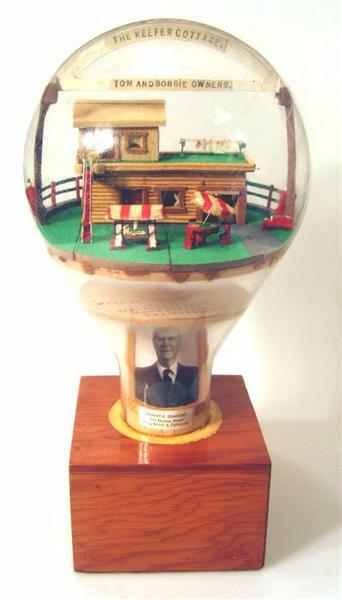 He began building scenes in bottles in 1900 and continued into the 1960's. He was a retired telephone company worker and before that a school employee. He and his wife moved to Long Beach, California in 1922. His earliest creations were in bottles but he began building scenes inside light bulbs as they became more available. I know of no other artist who included as much provenance in their work as he did. He almost always included his picture and a great deal of building information inside his lightbulbs. 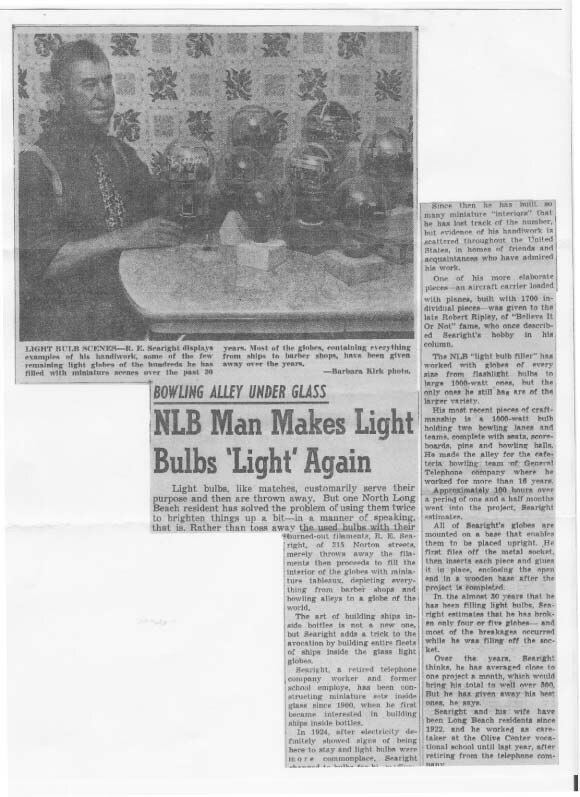 Among the information that he included with his light bulbs and on the stands were his picture, first name, middle initial, and last name, address, city, and state, phone number, the month, day and the year of construction, number of hours constructing, and the number of pieces used in the building. It is estimated the he made between 250 and 300 scenes in light bulb over his lifetime. Over the years, he gained and developed his talent and expertise by bottling many models until techniques are refined and mastered. Even the use of a light bulb itself is an indication of his skills and the level of difficulty he was able to display in his models. Light bulbs are more fragile than bottles and harder to open and build in without breakage. Because of this, few choose the bulb for the container and when they do it would normally be after experience is gained. Not only did Mr. Searight build in a light bulb, but his scenes are turned or inverted in the bulb so that they are positioned with the bulb in an upright position. Another bulb, “The Old Home Garage,” contains witty phrases and words relating to the type of work performed at the garage. There is an arch over the center of the scene that states: "They Will Not Fly - They Will Not Run, They Drink Gas Just For Fun." On the other side is the phrase; "The Old Home Garage, We Never Die, We Just Gas Away." Is the one staring back form the glass." 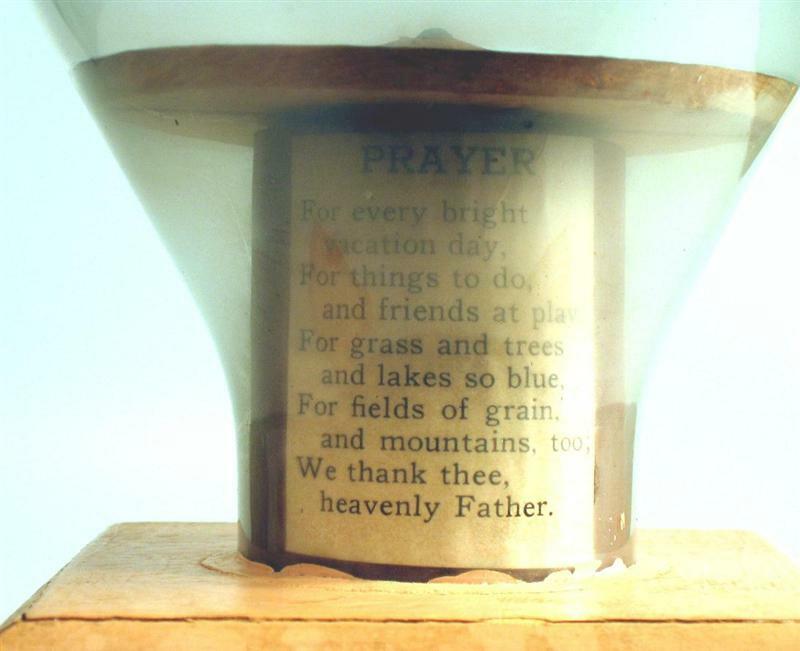 We thank thee, heavenly Father." The following entry was found on a Robert Searight and it is believed that it is the Robert Searight listed here. In April, 2017, I received the following account from a distant family member, by marriage, of Robert Searight. “I was at my mother's home in Kansas and we were discussing some genealogy and the Searight name came up. Robert's wife, Annabel, was the sister of my mother's grandfather. In 1963 our family was on vacation in California and we stopped by the Searight home to visit. Robert showed us his bottle collection and his current projects. As I recall, Annabel helped him by carving and putting together some of the pieces that eventually ended up in the bottle. I also recall that Robert was a huge LA Dodger baseball fan and friend of Sandy Koufax and others. I believe he said some of the bulbs he used were actually from some of the old baseball stadiums as well. The following is a newpaper article about Robert Searight and his work. It is from the 1950's of 1960's.